Hand & Foot is a popular variation of Canasta. Our game (HFO) is available for Windows and Mac users. It allows joining and hosting of public games and includes a variety of game options to accomodate the many variations of play. The 30-day trial allows hosting of two player games while the registered version may host up to four. 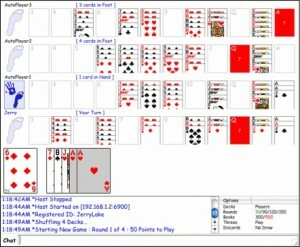 The registered version also allows auto players, for playing against the computer. See you in your Foot!